I'm 25. Do not have my CDL A yet. I already have my two year medical and feels CDL A permit for FL. WEL companies is UA only. Worked there for over a year and never heard of anyone getting a hair sample done. Also, First Fleet is UA as well. At least the one down here in Orlando FL is. Couldn't confirm on the other locations since they mostly act independently. Hope this helps. I'll be starting at Henderson on December 7th. They told me my Florida CDL permit was useless and that they still have me get an Illinois permit when I get there. Will probably mean nothing for at least a few years due to the appeal process. As to what exact changes it will make in Werner's student trainer program there is no telling. I would not worry about it right now.If you go through training with Werner this will take place ,if at all, well after you complete training. Reading your CDL manual? You should be using our High Road Training Program! It has the entire CDL manual built into it. We've broken it down into small chunks and added multiple choice questions to each section. We've also built in a review system which will recycle the questions you've already done for more repetition and better retention. It's 1000 times easier learning the materials with our program than it is trying to just read the manual by itself. You should definitely give it a go. Otr or regional? 30 miles in two days? That's crazy man. What's your average? On Sunday 8-16-2015 I leave for Career Tech in Lakeland Florida for my three week CDL training. Sponsored through PAM transport. They are paying for my hotel and schooling. I'm responsible for food and transportation to the school and hotel. Since I'm being dropped off at the hotel I'm really hoping I can carpool with whoever my roommate will be. School is from 0700-1700 Monday thru Friday. I'm extremely excited and nervous as hell. I've been reading up on my cdl manual and watching different videos. After the three weeks I come home for about a week then I'll get a phone call from my DM with PAM which I'll be given all my bus information and list of what to bring to Tontitown Arkansas. Three day company orientation where I'll meet my trainer then be on the road for about 17 days. From which point I will be dropped off at whatever terminal has the truck I'm assigned to. From what I've been told I will then have the option to get my first load and head home or get my first load and just start driving until I want to take home time. I hear Roehl does hair folical testing? How does that work out? Interested to know how far back they look. I hear a lot of people saying that companies will automatically disqualify you if you take any anit-depressants. Unfortunately Prime will not accept me due to my previous employer (non-transport related) terminated me. I guess I will continue looking. 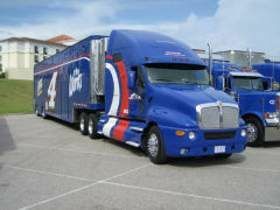 If anything I know I can go with PAM transport since they are ready to send me to CDL school and get me rolling, however I really don't want to be forced to team for 6 months. The first 10,000 really isn't 10k. It is 75 driving hours. I just finished that part. I didn't get to 10k. By the time I got back to test out I was well over 100 hours driving. We got allot of long runs in the beginning which didn't give me much backing practice. The last week we got put on a dedicated wall-mart account which got me allot of backing. Don't know why they tell you 10k miles when only 75 hours is mentioned after orientation. Do you do the 75 hours of driving with your permit and then have to take a road test at the DMV, or is there some paper they give you to take to the DMV saying you did all the requirements and stuff and then they just print a new CDL out for you? You are correct in the statement that you will be driving as a team for the 30K miles. Most trainers that I know personally at Prime are very good about teaching you what you need to know during that 30K miles. Their job is to teach you how to do your job once you go solo. They teach you about trip planning, fueling, how to use the Qualcomm, etc. From the time you start your training until you are solo is about 3 months (give or take). If you have any questions, let me know. I will do my best to help if I can. So from start of driving to 40k is roughly 3(ish) months? Thats not bad at all if you consider the alternative. Personally after hearing so many horror stories of drivers who were forced on team driving for their first year and having the entire experience somewhat tramatizing and "ruining" their trucking career, I would really like to try and avoid that. I hear Prime is a great company to work for, and a great place to get a start. I think I am going to try and talk to a Prime recruiter today and see what my options are as far as training. My only thing is, no income at all right now so trying to find a way to pay for food and the license itself (I believe the permit and license is a total $150 out of pocket) So should be an interesting challenge. Also, does anyone know if I will be able to get my CDL Permit in Florida and still be able to get my CDL License with Prime? Maybe that can give me a bit of a head start. New to the site and also trucking, though I have wanted to be a proffesional driver for quite some time. I am looking to get my CDL, I have checked a few companies out but I have only talked to a PAM recruiter (Steve with Driver Solutions). Prime: NOTE: The prime information I have is strictly from their website. Any feedback for this newbie would be greatly appreciated. Does Roehl do a hair folical test? I hear that a lot of companies are starting to due extensive testing on their applicants.